The pink radish is a summer vegetable which is available on the market from April to July. Other varieties of radish&amp;nbsp are found throughout the year. Radish is a root vegetable which packed with water, minerals and trace elements. It is rich in sulphur giving it a sharpness and stimulates appetite and digestion because of its fibre content. It contains approximately 15 kilocalories per 100 grams. Radish exists in pink, black and white varieties. The pink radishes are found in different forms which are longer or shorter and more or less sharp. Whereas pink radish is finger food (crunched with salt or with bread and butter), the black radish is more often eaten grated and in salads. The black radish or daikon is particularly eaten in Asia. The freshness of the product is demonstrated by the bright green leaves. 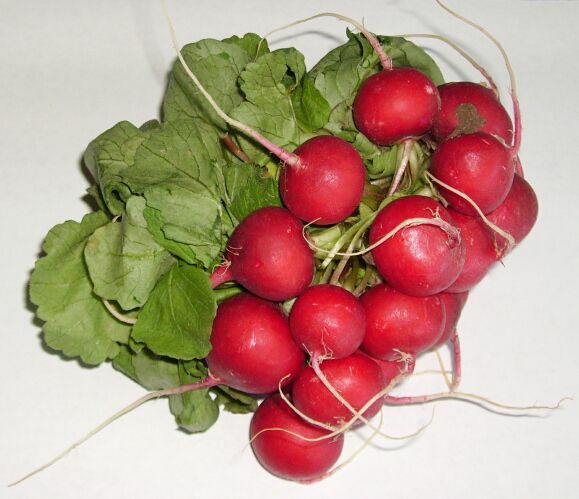 The radish (pink, red, white or black) is best chosen when they are smallest, firm and have no blemishes or cracks.